"I began a lifelong process of purification, a process of taking away what isn't essential"
"I will never allow in my lifetime a book with Picasso's paintings in my house, because they are bewitched. When people look at his paintings, they start painting like him. I like Matisse better as person, personality, art, everything." "I am not a teacher. An example, yes; teacher, no." "There is nothing good about getting old. It is a disaster that cannot be avoided." "I have to have it in my head, I do a drawing, and then I figure it out." "Well, I guess I was born a feminist because I always thought I was superior to my brothers. I mean they were physically stronger but I was stronger mentally." The political beliefs of her parents led Herrera to be taught in schools that followed the work of non-traditional educators like Maria Montessori, though she was also taught at Catholic school for a time. At the age of 14, Carmen was sent to finishing school in Paris, where, along with lessons in manners and etiquette, she received a thorough introduction to art history. Paris would become a city of central importance for Herrera's work. When she returned to Cuba at the age of 16, Herrera found the country in upheaval. She wanted to attend the Academia Nacional de Bellas Artes San Alejandro, but this would have meant breaking a strike enforced by students protesting the violence of Gerardo Machado y Morales's authoritarian regime. She instead attended a progressive women's cultural club called the Lyceum, where she studied painting, sculpture, and drawing. 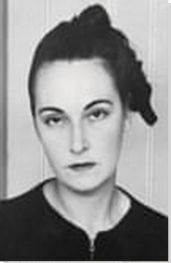 Though styled as a 'club', the Lyceum was an important base for pro-democratic, feminist, and culturally adventurous voices in 1930s Cuba, and there Herrera met many other artists; she was particularly influenced by the folk-inspired avant-garde artist Amelia Peláez. Herrera exhibited her own work for the first time at a group exhibition organized by the Lyceum in 1933, held at the Círculo de Bellas Artes. In 1938 she enrolled at the Universidad de La Habana to study architecture. Though she only attended for one year, her studies had a profound effect on her, and the influence of architectural theory can be sensed across her entire oeuvre. Herrera herself noted that at the university, "an extraordinary world opened up to me that never closed: the world of straight lines, which has interested me until this very day". The processes of preparing architectural drawings became fundamental to Herrera's artistic practice. In 1941, Herrera received a scholarship to the legendary Art Students League of New York, where she was taught by the Regionalist-esque Realist painter Jon Corbino. Herrera never quite settled at the school, and was particularly disillusioned by its emphasis on figurative painting over other media such as wood-block printing and sculpture. She lacked an artistic milieu, and longed for a group of supportive artists with whom she could discuss work and collaborate. Her relative lack of success at this time was brought to the fore when she was not asked to contribute to an exhibition of work by Cuban artists held at MoMA in 1944. It was only after moving to Paris in 1948 that Herrera found a group of artists able to inspire her. Though New York was beginning to establish itself as the hub of contemporary developments in modern art, artists from all over the world continued to flock to the more established art-world center of Paris during the post-war period, and the city sustained a vibrant cultural life both day and night. Herrera and her husband became friends with writer Jean Genet, who was himself friendly with many figures in Paris's literary and artistic circles. Carmen finally started to consolidate her own minimalist-abstract style, having discovered the work of precursors such as Kazimir Malevich and a supportive group of contemporaries including Axel Wilmar and Jean-Michel Atlan. 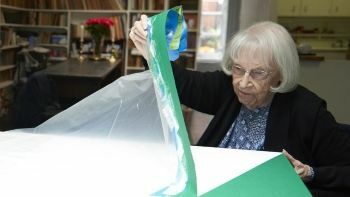 Her connection to the Salon des Réalités Nouvelles - where she exhibited between 1949-52 - gives some clue as to the artistic lineage she discovered in Paris. The Salon des Réalités Nouvelles was the successor to the Abstraction-Création group, the main outlet for post- Constructivist, Concretist, and anti- Surrealist tendencies in 1930s Paris, boasting members such as Piet Mondrian and Naum Gabo. Herrera thus took up her place in a line of minimalist abstract artists stretching back to the De Stijl, Neo-Plasticist and Constructivist movements of the 1910s. It is also interesting to note, given the Op Art style of much of Herrera's work, that Op Artists such as Victor Vasarely were developing their mature style in Paris at this time. In the early 1950s, Herrera travelled to Cuba, where visited her family and painted. She staged a solo show in December 1950 hosted by her former club the Lyceum, but the exhibition received relatively little attention. This led Herrera to conclude that Cuba was not yet ready for her work (although a budding Concrete Art scene was emerging elsewhere (yet quite far) in Latin America, with the formation of the Asociación Arte Concreteo-Invención in Buenos Aires in 1945, for example, and the Grupo Frente in Rio de Janeiro in 1952). She found a somewhat different situation in New York, where she and her husband returned in 1954. Abstract Expressionism had become the dominant method in the city's art-scene, and she befriended artists including Mark Rothko and Barnett Newman. Still, her own work did not flourish, partly because it was in a more austere, rational style than the emotionally-charged abstraction of the famous New York painters, but more primarily because of her gender. Whereas more Hard-Edged Abstractionists like Leon Polk-Smith found a limited audience for their work in New York despite its relative distance from the dominant modes, Herrera continued to be excluded from galleries and exhibitions. On one occasion, her friend, the gallerist Rose Friend, on rejecting Herrera's work, told her outright it was because she was a woman. Herrera has since noted that "[a] Latin woman, painting in the manner that I did stood no chance". In 1967, Herrera created her only full architectural design, a mausoleum for her dying brother. Though the building was never constructed, her sketches demonstrate many of the concerns that her artworks had always expressed, such as the relationship between different kinds of space, and the combination of formal simplicity and playful energy. In 1985, at the start of her seventh decade, Herrera staged her first major solo show, at the Alternative Museum in New York. This important museum, which aims to show the work of artists interested in social and political issues, has aided the careers of many artists over the years, including the Body Artist Hannah Wilke and the controversial photographer Andres Serrano. It was only after many years of painting and working that Herrera began to be recognized for her work. She sold her first painting aged 89 in 2004; the sale signalled a shift in her career, and she was soon lauded as one of Cuba's greatest undiscovered secrets. Herrera has remained sanguine about her late discovery, noting in one interview: "when you're known, you want to do the same thing again to please people. And, as nobody wanted what I did, I was pleasing myself." It is interesting to draw comparisons with the recent late successes of other women artists such as Rose Wylie and Lubaina Himid, whose work, like Herrera's, was for a long-time appreciated by a relatively small group of art-world initiates. Herrera's husband died in 2000 at the age of 98. The two never had any children, living togetherfor 61 years. The couple were close, and Jesse was extremely encouraging of his wife's talent and dedication to painting. Herrera's first European solo show came in 2009, at Birmingham's Ikon Gallery. The show was a roaring success, and went even further in establishing her as an important and inventive figure in twentieth- and twenty-first-century minimalist abstraction. In 2015, to celebrate Herrera's 100th birthday, a documentary about her was created by the American filmmaker Alison Klayman, known for her 2012 film on the Chinese artist Ai Weiwei. Klayman became interested in Herrera after meeting her when she was 98, and wanted to explore the contrast between her developed and confident artistic voice and her treatment and experience as an immigrant, Latina artist. In 2016, the Whitney Museum hosted a retrospective of Herrera's work covering the period 1948-78, with other galleries across the world following suit. With the aid of her assistant, the Puerto Rican artist Tony Bechara, Herrera continues to produce work into her 100s, and may well be the oldest-living, important contemporary artist. The legacy of Herrera's work is difficult to trace, not only because she is still living but because she worked in relative obscurity for so many decades. Engaged with abstraction and minimalism at the same time as many better-known artists, we can place her in the company of various international movements, including North-American Hard-edged Abstraction - practiced by contemporaries such as Ellsworth Kelly - the late vestiges of Concrete Art movement in 1940s-50s Northern Europe, the Parisian Op-Art movement, and the Brazilian Neo-Concrete movement established in 1959, involving women artists such as Lygia Clark and Lygia Pape. But unlike many of the figures just named, Herrera's work was little viewed at the time, and so it is difficult to say precisely who was inspired by it. It is possible that Kelly himself, an artist eight years younger than Herrera who was interested in the same pared-down style, saw some of her work in New York and Paris. Suffice it to say, Herrera's status as a central figure in modern art will be further solidified in the years to come. As the curator Dana Miller writes, "the totality of her more than seventy years of creative output is a stunning body of work that places Herrera firmly in the pantheon of great post-war abstract painters alongside the likes of Ellsworth Kelly, Agnes Martin, Barnett Newman, Ad Reinhardt and Frank Stella." Moreover, Herrera's influence has already spread to the world of fashion. Albert Kriemler, creator of the Swiss brand Akris, cited Herrera as an influence on his Spring 2017 show, using several of her paintings to form the basis of prints on a wide range of clothing. Herrera's legacy also lies in the example of her late-blooming career. Like other women artists such as Louise Bourgeois, her life has been dedicated to art, but she did not find an audience for her work until she was very old. Her legacy, then, is not just about her painting but about her tenacious creative perseverance in the face of an indifferent, oar biased, world. This painting, ambiguously entitled A City, was created during a key phase of Herrera's life, while she was living in Paris following the Second World War. Herrera has since commented of this time: "[i]t was about meeting new people and gaining a new set of influences and learning to filter and absorb those. Everything was marvellous; everything was possible". The sense of possibility and excitement is fully apparent in this work through the jostling shapes, colors, and forms.